Why wouldn’t I have the time to read? When you read a book, you’re investing in yourself. I want to grow and better my business, and one way I’ve been able to be successful in that is by reading. To tell you the truth, it isn’t that hard to find the time. If you know how to manage your time, you can find some wiggle room in your calendar. The hard part is actually sitting down and reading a book. I have 90 different things about the business running through my mind at once, so when I find the time to unwind I typically head for my phone. As a small business owner and as a human, I’m sure you do the same. It’s what I do next that’s different. More often than not, you’ll find me listening to my books. Why? Cause it allows me to multitask. Using apps like Audible are an inexpensive way to get through a book in no time. Think of it like listening to a podcast or the news. I know I retain the information better when it’s being read to me rather than me reading it. It’s cliche, but it works. I’m a goal-oriented person, and I always set some with the intention of reaching them. I made it a point to read two books a week about a year ago. While it took time, I eventually created and followed a sensible schedule for myself to achieve this. As a small business owner, we should strive to be expert prioritizers. Make some ground rules that make sense and go from there. Think about it- you have 24 hours in a day. Roughly about 8 of those are spent sleeping. What are you doing with those other 16? Use your time effectively and make it a point to prioritize your tasks. This isn’t just something you should do to make time to read, but to create extra time to do whatever else you may want to do with your 16 hours. 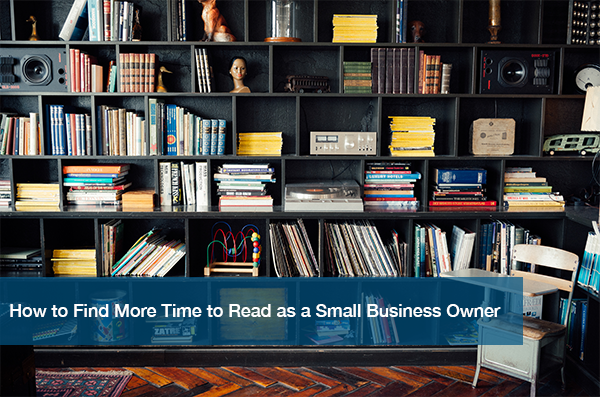 Creating time to read should become a priority in your life as a small business owner. Invest in yourself, invest in your business, and expand your mind with a good book. Check out Amazon’s Business book section for some great reads. There’s literal millions to choose from, so you’re sure to find one that will have great influence. If you need help creating more time during your day, refer to my post Are You a Time Waster? and learn how to create an activity log.